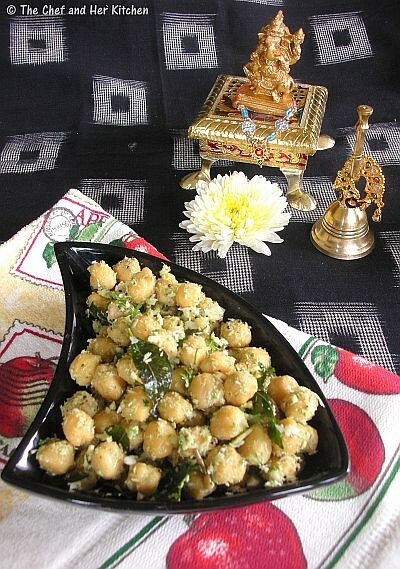 We always make a variety of sundal for any festival as it not only adds the number of items to the menu but also it is very easy to prepare and an absolutely guilt free snack to compensate the extra calories from the fried stuff and sweets made on festivals.Hubby is a big fan of sundal especially when made with kala chana,as I did not have them at that moment I went ahead with kabuli chana and made this along with Kudumulu for Ganesh Chaturthi.This is a perfect guilt free snack which can be served as a snack or as a side dish in lunch or breakfast. Soak Chana overnight or at least for 8-9 hrs and pressure cook for 3 whistles until soft.The Chana should be soft and firm to touch and should not be either hard or mushy. 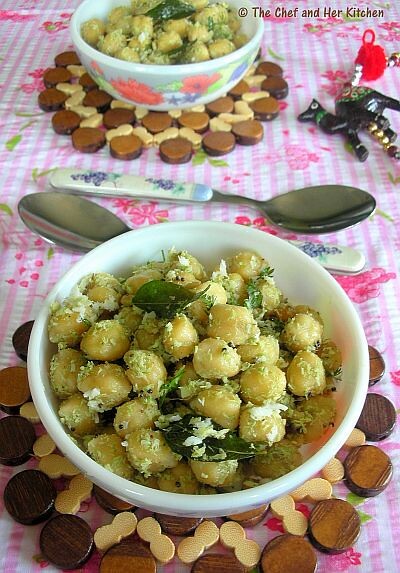 You can add salt while cooking chana or add it at the time of tempering. Drain the chana and keep it aside,you can use this drained water to make healthy rasam. Add hing,curry leaves and ground coconut-green chilli paste and fry it for a minute. Add cooked and drained chana and required amount of salt and mix well and cook it on low flame for 2 mins. 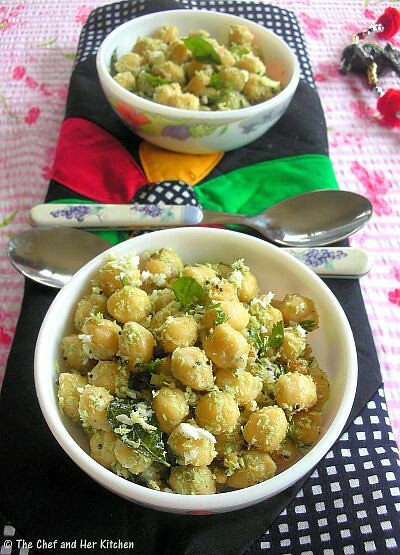 You can replace kabuli chana with kala chana,lobia,green gram,yellow peas or chana dal for variation or you can even use mix of these legumes to make variety sundal. You can add red chillies while tempering and reduce the green chillies in the recipe. I also like this a lot and will always prepare in the same manner. Love sundal any time. Guilt free gorging. Love to have this anytime and healthy snack too. Bowl full of goodness just making me drool. 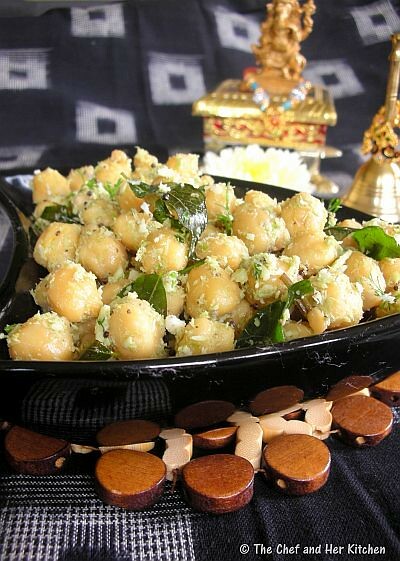 Lovely looking sundal with soft and big big channa...Yumm! Thisis one of my fav,..had this so many times but never tried at home thanks for the recipe,. Like your presentation ! The Sundal looks delicious too! Wow.. cute adorable Ganesha looks so nice..fantastic presentation..delicious sundal! Can eat Sundal anytime, anyday.Lovely! Love this for breakfast!!! Looks yummmmm!!!! I love the green hue of this tasty sundal! Delicious one and a very colorful presentation. 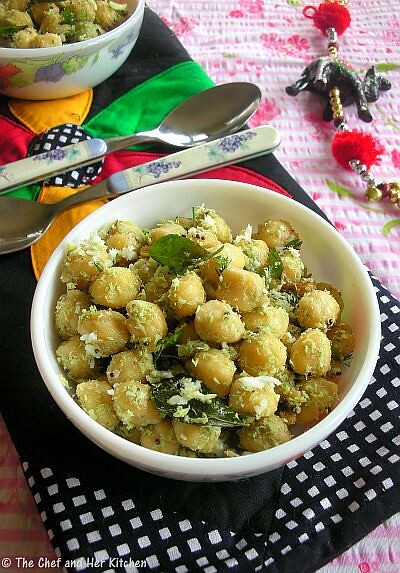 kala channa sundal (kadale kalu as we call in Kannada) is a must at our home for Gowri Puja. It is prepared in the evening & served as prasadam for the ladies who visit our house. looks delicious, nice presentation..i too make this..
nice post dear. ek request hai - cna u plz post the recipe for sambhar masala? thanks. beautiful pictorials and lovely recipe...love the Ganesha idol....love the cute bowls too! I love the simplicity of this sundal more so if the chana is black. Nicely coated with coconut. nice clicks. While Soaking Chana overnight add liquid "Red food color" about 10-15 drops. You should see red colored Chana and proceed with your recipe. This is your "Red Sundal". Enjoy!